Our roaming reporter came across this wonderfully silly sign the other day. The man is old enough to remember the times, when one could buy scaffolding fit to be used in any direction whatsoever. South, North , West even South West by South caused no problems whatsoever. 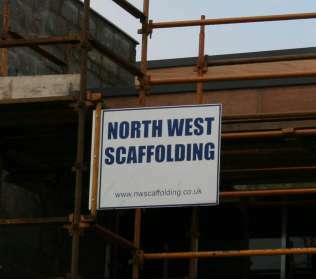 It seems that in this day and age if one needs to erect a scaffold, not only does one need an accurate compass, but one may also waste a lot of valuable time looking for a competent specialist supplier. We invite our knowledgeable readership to study the two photographs below. They are both of Catherine Street taken from about the same location. The first, we suspect, was taken in the early 1950s, the second was taken a few weeks ago. At first glance it seems astonishing that so much still looks the same. Obviously drivers in the past were so good, they didn't need white lines to show them were to park their cars. All the old cars are high enough to wear a tall hat in - and then some. The splendid 1950's concrete street lights were in a class of their own and there were so many buses, that they tended to travel in packs. 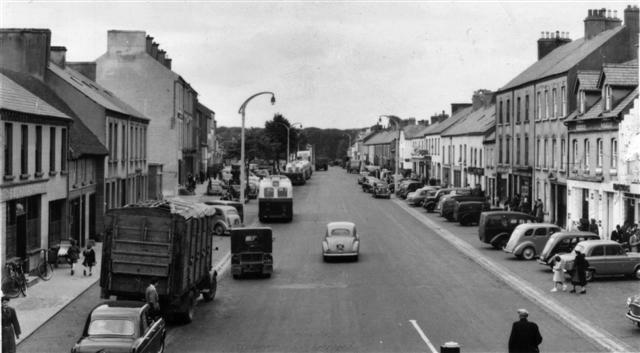 The Thatch on the left still had a thatch and the cattle truck heading towards it is nearly as old and dilapidated looking as similar vehicles do nowadays. There seems to have been a dense forest at the edge of town and at least one citizen felt that it was quite safe to walk in the middle of the road. Come to think of it, his ilk have survived to this day and age. The installation of the new water sewer has started in Mill Place Road at the bottom of Main Street. 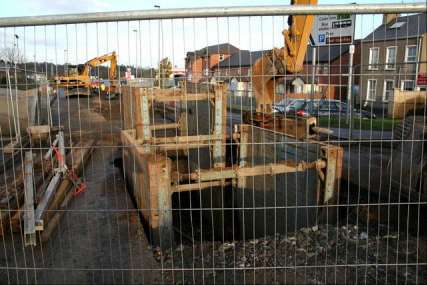 The size of the hole dug into the road gives a vivid impression as to what is in store for the rest of the town as work progesses. 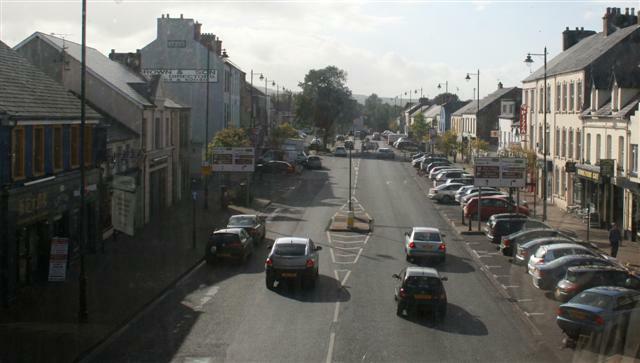 It seems that the beginning of next year could be very interesting for Limavady, traffic-wise! Regular readers of this paper will no doubt be glad to hear that today, the 21st of December, is the shortest day of the year. In fact, the December solstice will be at exactly 17:47UT today. As can be seen from our Roe Valley Winter scene on the right, the mountains of the Valley have not escaped the nationwide flurry of snow and Benevenagh - sheep and all - is covered with a seasonal layer of snow. 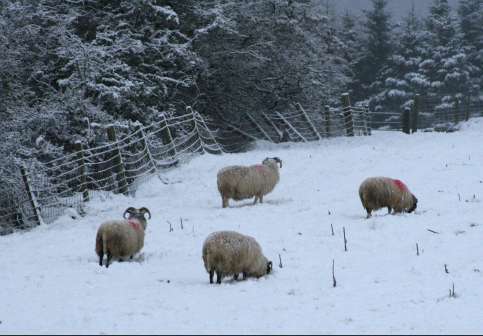 Wouldn't you wonder what those yows find to eat in all this white splendour - ice cream? Every once in a blue moon there is a blue moon - and on the last day of the last month of the year 2009 you can admire it for yourself - weather permitting . A blue moon is a second full moon in a month - which doesn't happen all that often - in fact it hasn't occurred for nearly 20 years. Not only will this moon be blue, but at around twenty past seven in the evening, there will also be a partial lunar eclipse - so the moon won't be as blue as it thought it would be after all. Only about eight percent of our satellite will be obscured, so with any luck drivers will still be able to see the icy roads. 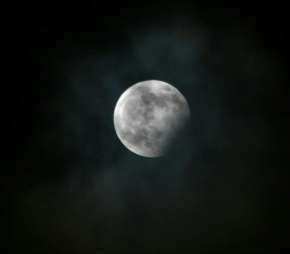 The photograph above was taken during the eclipse, when the moon just managed to peek through the clouds.